Help a young girl explore the lonely countryside around her childhood home when she misses her bus to school. Although very short, Home Is Where One Starts is a captivating experience with excellent narration and interesting environments. The short length along with the absence of puzzles or action means it won’t appeal to everyone, but players who enjoy more relaxing titles like Gone Home or Dear Esther will feel right at home. Gameplay: The walking speed of the protagonist is a little slow and the gameworld small, but exploring it is interesting. Graphics: The visuals are quite beautiful, but some objects lack detail when viewed up close. Memories are tricky things. Some fade away over time while others stay with us for the rest of our life. Home Is Where One Starts is a game about the memories of a woman who grew up in a broken home somewhere in the American South. It follows the events of a single day where she missed her bus to school and decided to explore the desolate area around her house instead. We get to view the world through the eyes of a child, while the narration is done by a much older version of her, reflecting back on that particular day. Home Is Where One Starts is not a game that focusses on puzzles or action, but instead leaves players free to simply explore and immerse themselves in the atmosphere. Those familiar with games like Dear Esther or Gone Home will know what to expect, but HIWOS is even simpler. The lonely countryside setting isn’t very big, but from the perspective of a child it had a world of opportunities. However, despite her tranquil surroundings, it is also clear that the protagonist had to deal with plenty of hardship during her childhood. The tiny trailer in which she lived with her father is sparsely furnished and show clear signs of neglect, while outside it garbage and empty beer bottles are heaped up. Careful exploration also reveals the places where the protagonist sought refuge from the depressing conditions at home. Where she retreated into her imagination to make her world a happier place and to get away from the cramped confines of her room. Since the game is extremely short and can be completed in a single 30 minute sitting I don’t really want to divulge any more of the locations. Apart from walking around and triggering narration for special locations you can also pick up and examine some objects. However, these are few and far between, so don’t expect anything like Gone Home. HIWOS runs on the Unity engine and actually delivers some very nice visuals. Since everything is viewed from the perspective of a small child the world and its objects appear larger than usual, which is a really nice effect. Trees and foliage also sway in the early morning breeze, while the sun rises over the horizon. Unfortunately, up close the objects and textures look a lot less impressive though. Yet, my favorite part of the game is the audio. A single, slow, haunting melody accompanies your exploration, along with the sound of birds singing and the lonely footsteps of the protagonist. The only voice acting is that of the narrator reminiscing about her childhood, but she delivered her lines in a manner that frequently left me with goosebumps. None of the dialogue feels forced or overly dramatic and the voice actress managed to capture all the emotions perfectly. My only criticism is that I would have liked to hear more of the narration as not everything you find or see triggers a voice-over. Controls are very straightforward, with WASD handling movement and a single mouse-click for interaction. Since the protagonist is a small child the pace of the game is very slow, which might annoy some players. HIWOS is not a game to rush through though, but to slowly explore while taking in all the detail. The invisible walls you encounter are also a little annoying, but understandable. The story of HIWOS is not a new one and neither is it very groundbreaking. There are countless books and films that deal with the subject and the developer himself mentioned that he drew inspiration from countryside stories like The Tree of Life and East of Eden. In fact, the title of the game is derived from a poem by T.S. Eliot. Despite all of this the game remains captivating and really captures the feeling of stepping into someone else’s memories. The replay value is not very high, but it is possible to miss a couple of locations, which makes it worthwhile to play through more than once. HIWOS isn’t a game for players that want clearly defined goals, challenging puzzles or plenty of action. The game offers a calm, reflective atmosphere where there is no rush or danger. Some players will find this extremely boring, while others will appreciate what the game is trying to achieve. The asking price for the game is also low enough to make it an impulse purchase. Ubinota is a game that appears to be deceptively easy at first, but it definitely delivers a challenging experience as you progress. Levels not only come in all shapes and sizes, but thanks to the different paint colors, all with their own unique properties, the game never becomes repetitive. 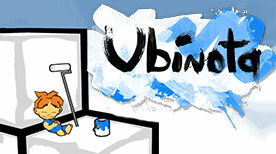 Anyone looking for a unique puzzle experience should definitely add Ubinota to their collection. Gameplay: Very addictive and very challenging. Graphics: Simple, but very colorful. Sound: Very relaxing. LocoCycle is a game that revels in it's cheesy b-movie plot and backs it up with some nice arcade-style gameplay. Alternating between shooting cars off the road or beating up flying bad guys with martial arts moves is as entertaining as it is wacky. It's not the longest or most in-depth game we've ever played, but it is definitely worth the low asking price. Gameplay: An arcade-like experience which lacks depth, but is a lot of fun. Graphics: Nice character detail, but the environments feels a bit sparse. Sound: A nice performance from the Prague Symphony Orchestra and solid voice acting. Join Narumi Kouki, a hardworking manga author who is still a student as he tries to juggle work and studies. To complicate matters for Kouki, he is pressured into joining the student council where he finds himself with more responsibilities as well as the only guy among a group of beautiful girls. Wagamama High Spec is a typical slice of life visual novel with a school setting, but the charming characters, humor and different routes make it stand it from the competition. There’s nothing really new here for people who are tired of the setting or tropes, but the writing is good and the visuals very polished. Gameplay: Not a lot of choices, but they do lead to four very different story paths. Graphics: Beautiful illustrations, tons of CGs and some nice backgrounds. Sound: Full Japanese voice acting along with plenty of great tunes. While most fans would have loved to see a PC port of Guilty Gear Xrd, the latest installment in the series, appear on PC instead of #Reload, it doesn’t mean that it should be dismissed. This game still has just as much to offer as it did ten years ago and fighting game fans that somehow missed out on it are in for a treat. There are a ton of modes that will keep you busy for ages and the huge cast of crazy characters offer something for every fighting style. Considering its age the game has held up extremely well and hopefully garners enough interest to prove that there is a market for more of these games on PC. Gameplay: A huge character roster to select from and fast paced fights makes for an adrenaline pumping experience. Graphics: The visuals might be old and 2D, but they still look very impressive and the game is not afraid to take things over the top. Sound: Some of the character voices can become annoying after extended playing sessions, but the soundtrack is still great. Eversion is a very niche platform game that is definitely not going to be to everyone's liking but fortunately there is a free version available that should give you an indication if this is a game for you or not. Just be sure to play more than just one level as things get progressively more interesting... Gameplay: Pure platforming with a unique twist. Graphics: Call it retro or call it dated but it has a style and charm of its own. Sound: Plays a big part in the games atmosphere and is nicely done.